The Monterey Bay Aquarium is definitely one of the top sights on the Pacific Coast Highway, right up there with Hearst Castle and Big Sur as places you must see. Well, it’s hard not to see Big Sur, you drive right through it, but to get the most out of a visit to the aquarium you should plan to spend a night in Monterey, Pebble Beach, Pacific Grove, or in neighboring Carmel. If you stay in Carmel and do the 17-Mile Drive, it will bring you very close to the aquarium in Monterey. The Jellies Experience is the latest special exhibit to open, and this is devoted to the fascinating and rather strange world of the jellyfish. 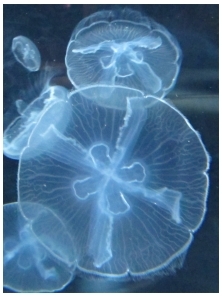 We had no idea there were so many different kinds of really beautiful jellyfish, and the Jellies Experience is an imaginative display that shows these sometimes surreal worlds. With some fun Sixties Psychedelia too, it’s an exceptional exhibition, and you can read more about it on our page about The Jellies Experience jellyfish exhibition. How Long to Spend at the Monterey Bay Aquarium? There’s a lot to see at the aquarium, and there are events and activities, including feeding times for penguins, otters, sharks, turtles, and other creatures, that are always popular to watch (so get to these early to get a good spot.) There are talks throughout the day too, but these usually include the opportunity to get up close with some of the sea creatures, animals and birds, and these too are always entertaining and especially delightful for children. So, it’s hard to say how long you might want to spend there. We would suggest you allow a minimum of two hours, to even get around everything. Allow half a day or more if you want to try to catch fun things like the otter feeding and training program, and the musical shows too. As for your own feeding program, there’s a casual self-service café (11am-4pm) if you want a quick meal, and a restaurant (11am-2pm) where you can enjoy a fabulous view of Monterey Bay. 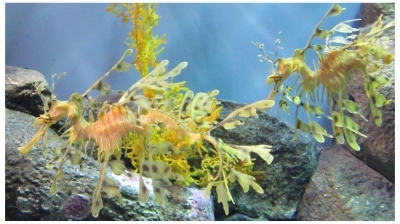 We are always drawn to the displays on the seahorses and the sea dragons (above), which we love so much. We never miss feeding time with the otters, where the staff also show you how they train and inter-act with the animals. The Kelp Forest is a really mesmerising display, and is one of the tallest aquarium exhibits in the world. Watching leopard sharks and other creatures glide quietly by, while shoals of sardines swirl around creating impressive natural patterns in the water, is a beautiful way to appreciate the underwater world. 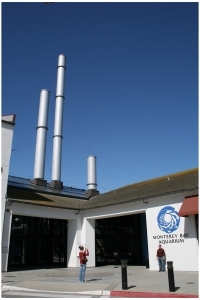 The aquarium is at the west end of Cannery Row, and the entrance is at the junction of Cannery Row and David Avenue. If you’re staying in the old part of Monterey, nearer to Fisherman’s Wharf, it’s only a 20/25-minute walk to the aquarium. In the summer there’s also a free visitor trolley linking all the main Monterey sights. You can also park bicycles for free, just across the street from the main entrance. The aquarium is only a short drive from Pacific Grove, Pebble Beach and Carmel, and there are several parking garages nearby. Free street parking is hard to find, so our advice is not even to try. Check the aquarium’s website (see link below), which has very thorough information on all of this.